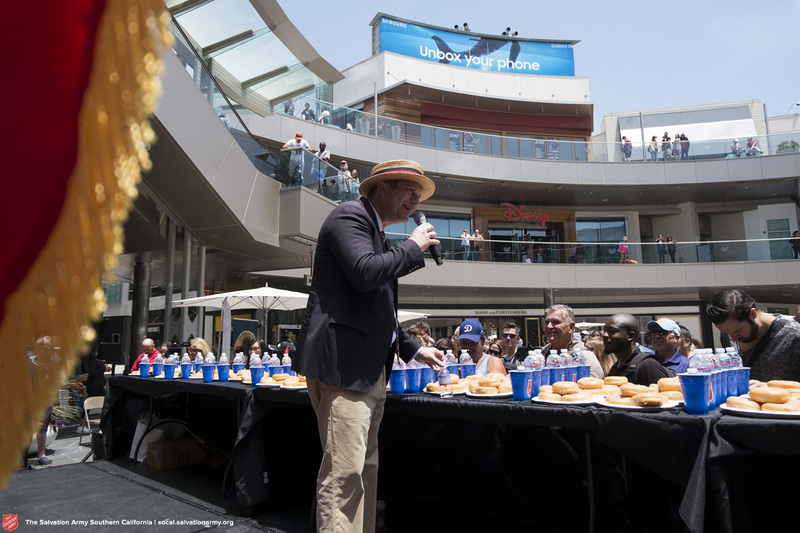 HOLLYWOOD, CA – The Salvation Army, along with its corporate sponsor Bakemark, will host the second annual National Donut Day World Donut-Eating Championship as part of a fundraising challenge for much-needed veteran services in greater Los Angeles. The event will take place at 11:30 A.M. on Friday, June 1, 2017 at the world-famous TCL Chinese Theatre, 6925 Hollywood Blvd, Hollywood, CA. Competitors will have eight minutes to consume as many glazed donuts as they can. Last year, Joey Chestnut, the number-one-ranked eater in the world took home the crown and set a new world-record of 55 donuts in eight minutes. This year, up and coming competitive eating superstar Matt Stonie takes up the challenge and will try to top Chestnut’s 55 donut record. If you can’t make it to TCL Chinese Theatre you can still help The Salvation Army support veterans on Donut Day. 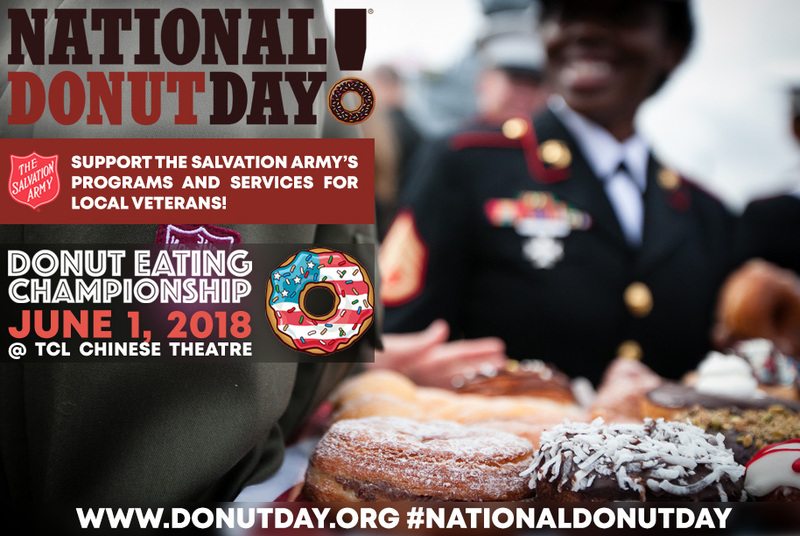 Just look for the National Donut Day Poster in your local donut shop window and you’ll know a portion of donut sale proceeds on that day will go toward Salvation Army programs that are helping veterans across Southern California. Today, the Salvation Army’s tradition of caring for our men and women in uniform continues full-stride. In Southern California alone, The Salvation Army operates multiple programs for veterans from full service shelters like Bell Shelter - one of the largest homeless shelters West of the Mississippi as well as its innovative Veteran Employment Services (VES) program with satellite offices across the Southland that help veterans not just find jobs, but careers. National Donut Day was created by The Salvation Army in 1938 as a fundraiser that honored the memory of The Salvation Army’s volunteer “Donut Lassies,” who served up the comforts of home (donuts and coffee) to soldiers during World War I. These remarkable young women made home-cooked meals to the boys in the trenches, read and wrote letters for those who could not read and write and made donuts…lots and lots of donuts – using their creative initiative with whatever “utensils” they had on hand like empty wine bottles for rolling pins, spent shell casings for cutting donut shapes and helmets to cook the donuts. The Salvation Army, an evangelical part of the universal Christian church established in 1865, has been supporting those in need in His name without discrimination since 1880 in the United States. Today, more than 30 million Americans receive assistance from The Salvation Army each year through the broadest array of social services that range from providing food for the hungry, relief for disaster victims, assistance for the disabled, outreach to the elderly and ill, clothing and shelter to the homeless and underprivileged children. About 82 cents of every dollar raised is used to support those services in 7,000 communities nationwide. For more information, go to socal.salvationarmy.org.